A heart-broken Randy Damans says good-bye to Lucky. GEORGE NEWS - Randy Damans (27) from Parkdene was over the moon when his friend Sayed Sharara aced third place on Randy's trusted steed Lucky at the George Agricultural Show on Saturday 1 September. On Monday 3 September the euphoria of the weekend changed to misery when his friends told him that Lucky was in distress and writhing on the ground. He rushed back from work and found the SPCA's Andrea Auerbach attending to his horse. Lucky was rolling around in agony. 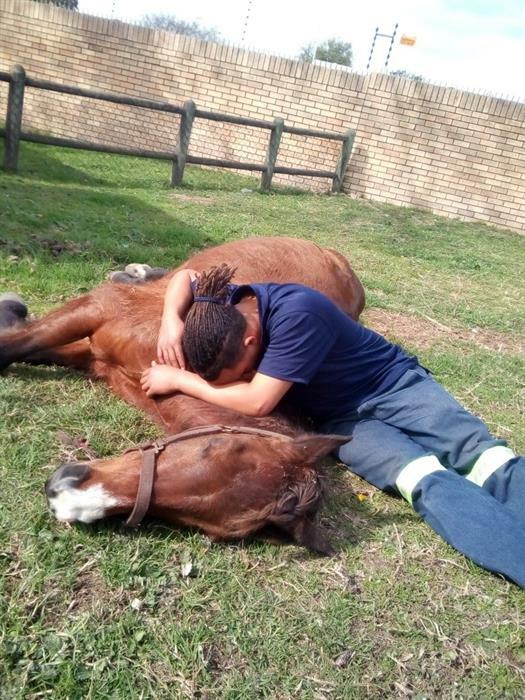 Auerbach diagnosed him with severe colic and tried to make him more comfortable by administering pain killers. The next morning Randy took Lucky to the People's Dispensary for Sick Animals (PDSA) in Conville. He said the PDSA vet Shirley Smith tried her best to save Lucky. "We soon realised it was a lost cause. Lucky was in terrible pain. My heart dropped when the vet said the humane thing to do was to put Lucky out of his misery. I hated the thought, but knew it was the right thing to do." Smith told the George Herald that colic can build up over a long period of time and due to the sensitivity of a horse's gastro intestinal system, an attack of severe colic is often fatal. "Without surgery, we have to decide if the horse has any chance of recovery, and often euthanasia is the kindest option." Surgery is extremely expensive. Lucky was a present from Randy's father Dumpies, who had recognised Randy's love of horses and gave him Lucky ten years ago, knowing the horse would be in good hands. 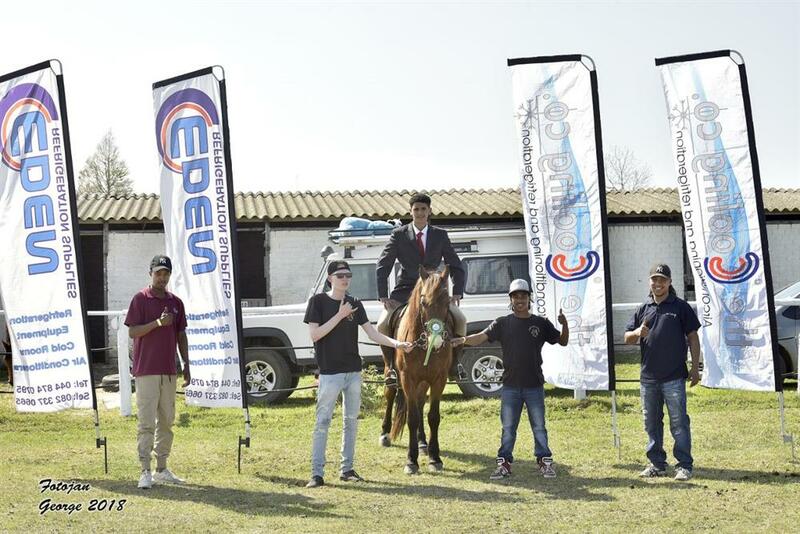 "Keeping a horse and entering it in a competition is an expensive exercise and I would like to thank my boss, Shaun Schofield of the Cooling Co, and Ernest Langenhoven of Eden Refrigeration for their support," said Randy. A proud moment for the Mustang Riding Club at the George Show. From left: Enrica James, Mashiano Ruiter, Sayed Sharara on Lucky, Curtley Mentoor and Randy Damans. Randy finds consolation in his continued involvement with the Mustang Riding Club in Borcherds. His friend Enrica James will be entering one of his three horses in next year's show. James is confident that the horse-loving people of George will once again come forward to help them prepare for next year. "This was the Mustangs' first but certainly not our last competition." For more information on the Mustangs Riding Club contact Curtley Mentoor on 062 053 5445.